At four o’clock on December 9, parliament passed the historic motion for impeachment in an overwhelming vote (234 in favor, 56 against, 7 invalid votes and 2 abstentions). At seven o’clock, the moment a copy of the motion was delivered to the Blue House, Park’s presidency officially stopped functioning. She was replaced by the prime minister as acting head of state. Another copy of the motion was sent to the Constitutional Court, which is supposed to issue a final verdict on the case within a 6-month period. Thus, the whole process is in the hands of the Constitutional Court judges, who are mostly conservatives with a few liberals in the minority. The impeachment was a relief for the opposition parties, who proposed a consultative body comprised of representatives from the government and political parties to facilitate smooth governance in time of political crisis. However, the ruling party is riddled with fierce factional leadership struggles, and is on the verge of total collapse. The 7th National Day of Candle Light Action was another huge success: despite its smaller scale compared to previous mega-protests, one million people participated nationwide. 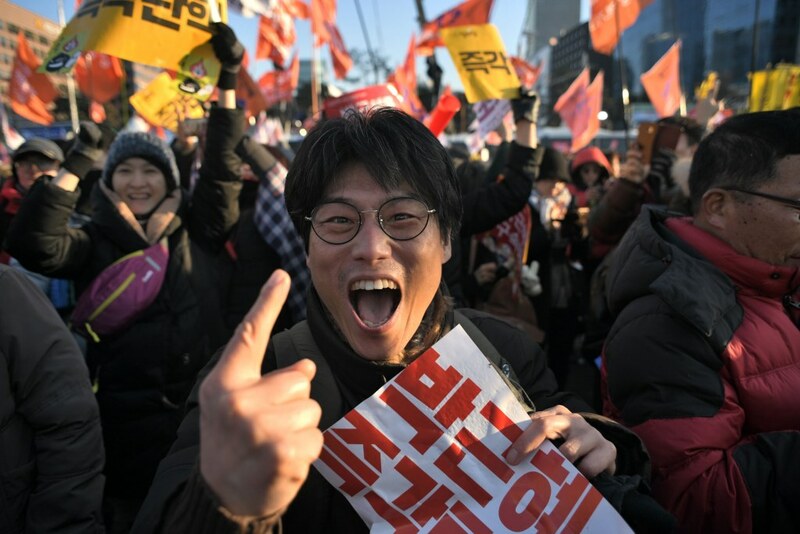 The atmosphere at the rallies and marches was more like a festival celebrating an important victory, but the crowd still demanded the immediate resignation and arrest of Park Geun-hye. Most participants said the impeachment was not the end, rather it a new beginning, and that they now had a precious opportunity to eliminate the corrupt political system and radically renovate politics. Many voiced their determination to join protest every Saturday until the final ouster and arrest of the president. Thus, after the impeachment, the candles have not died out. All eyes are now on the proceedings in the Constitutional Court. According to a latest poll, more than 80 percent of respondents supported impeachment, and more than 60 percent want the immediate resignation of the president. On December 11, Sunday, the prosecution publicised the results of an investigation into Choi-Park gate, and again clearly identified the president as a criminal accomplice. On top of this, another round of investigations by a Special Prosecution Team is meant to start this week, with a focus on bribery and corruption charges, and parliamentary hearing sessions are ongoing. In the course of further investigations, more scandals are likely to be revealed. Given the impeachment charges are so extensive, the concrete schedules of the impeachment trial are still uncertain, though the Constitutional Court judges told the press that they would do their duty as swiftly as possible. In this context, the conservative media is exhorting the opposition to take the initiative away from the politics of square, stabilise the situation and return to politics as usual. After the impeachment, the media’s focus has moved toward the next presidential election, which will be held much earlier if the impeachment is finalised. Thus, the extra-parliamentary struggle of the candle light grassroots is now faced with a significant watershed: either it is to be absorbed by institutional politics and its routine, or it is to go forward and finalise the ouster of the president and pursue a radical alternative to politics as usual. The coming months will witness the next round of struggles between the institution politics of the status quo and the grassroots politics of square.